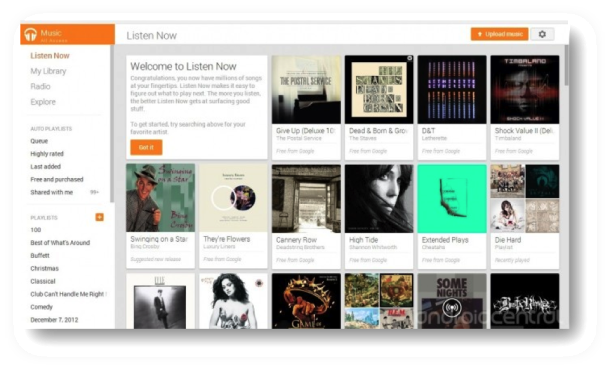 Over the past 48 hours there has been a lot of speculation on Google’s new music streaming platform, Google Play Music All Access. I’m surprised, however, that very few speculations have gone beyond the like-for-like comparisons with other music subscription platforms. Given my background in search, I’ve been trying to think about the bigger picture of why Google, principally a search engine, are launching GPMAA. Why would Google want to operate in the music streaming space? I may be wrong, but I think that GPMAA is largely about improving Google search results for music-based queries, and capitalising on the 25,000,000+ music download related searches that come from Google on a monthly basis. In the same way that Google has entered the credit card, real estate, and air travel niches over the years to help people find what they’re looking for faster, I believe that Google is trying to pursue their mission of delivering the most relevant results to the user as quickly as possible – this time with music. 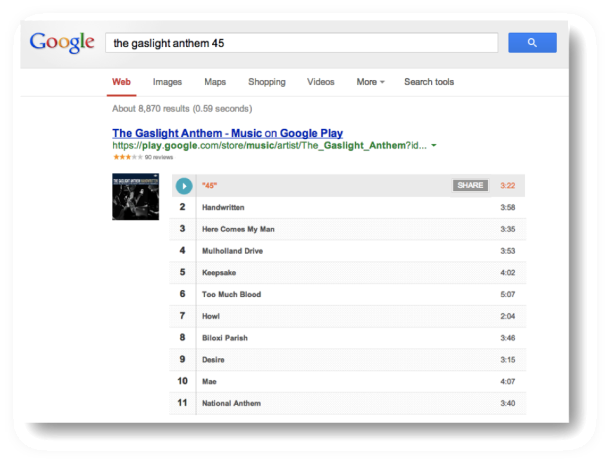 According to Google’s keyword tool, over 245,000 people search in Google for queries containing “buy music” per month. This jumps to 24,900,000 for terms containing “download music”. Of course, there are likely tens of millions of searches around artist, track and album names that wouldn’t be included in this figure. With such a huge volume of people going to Google in search of music, combined with the government pressure to stop directing traffic to illegal download sites, this seems like it may be Google’s belated response to tidying up search results for music queries and capitalising on the opportunity. When I go to Google in search of music, it’s fair to say that the results I’m served are exceptionally poor. In this instance, the results that Google serve me do not match my search intent. 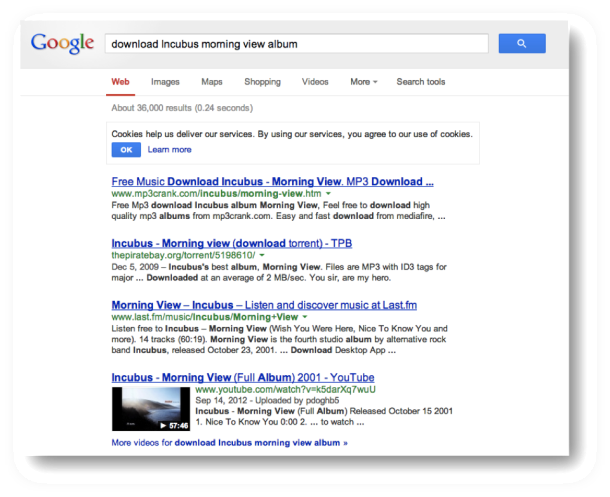 I want to download Incubus’ album – but instead Google is pointing me in the direction of illegal download sites, music videos, and a streaming platform. To paraphrase Google’s mission statement, they want to offer me the most relevant result in as few clicks as possible – and at the moment there are no legal and relevant results within 3-4 clicks away. Surely Google can do better? So here is where I think we’re heading. Please note that these are photo-shopped images, and not actual screenshots. While I have photoshopped the +1 engagement and the #1 ranking, none of the rich snippet markup has been edited. Google are already using Schema.org markup heavily to deliver attractive rich-snippets in search results surrounding music-related queries. So what about if I were to search for a single track? What could Google do to reduce the time it took for me to get what I’m searching for? What if I could stream / download / buy directly from the search results? Again, this search result is heavily edited to display what I think Google could potentially do (it’s not a real result). There’s really no end to how Google could integrate GPMAA into search results – and it would be objectively and genuinely useful to the user if they did implement this. When I search for ‘The Gaslight Anthem 45’ this is exactly what I want to come up. Are Google filling a much-needed gap in the market? In my opinion, Google aren’t trying to eat the other streaming platform’s lunch. They’re just trying to fill a gap that the other music subscription services have been very slow to respond to – offering high quality and search indexable music content for the tens of millions of people who search for music in Google. Most music-subscription platforms have gated their content off from search engines, due to a combination of technical and licensing reasons. GPMAA’s content is not only indexed, but it’s specifically marked-up to be highly clickable from the search results. If that’s not a sign that this has a lot to do with search then i’m not sure what is. I’d be sincerely interested in discussing this with anyone who has any strong opinions on my take. Feel free to leave your comments below, or if you’d prefer to discuss in private, you can email me at marcus (at) ventureharbour (dot) com. Great post Marcus! Got me thinking a bit more about what Google’s up to, especially as I’m a big ambassador of Spotify as a service as well! I think the move is a strategic play to get people more engaged with the Chrome/Android OS, which would actually lead people away from search and potentially reduce volumes. They still need to figure out how they merge the two OS though (like Windows have tried to do) but in reality all the “music on demand” element does is makes their own music service, and therefore platform, that bit more attractive to agnostic users. The play.google.com site does already have public pages for most artists and albums, not as far as track by track pages like Spotify and Lastfm, but they do appear in search. They’re still way down the rankings generally compared to Last.fm though, who are omnipresent for most music related searches, although even they struggle to get into the top 3 most of the time. And Lastfm is a well optimised site IMO! Plenty of authority and history, loads of long tail orientated content and a good UGC element that Google can’t compete with. But whoever’s top dog in natural search is surely a moot point for Google long term, as the more people they get into the Chrome/Android OS the more people will be herded to Google products anyway, negating the need to search the WWW at all. As far as driving profit, I’m thinking that the flow of visitors from natural search might not be that lucrative to Google at all. I do actually think Google have a massive opportunity to fill a gap in the market with truly social music. Most music on demand platforms are massively under developed IMO, Spotify piggy backs off of Facebook for social elements, Last.fm has great social elements but has a terrible approach to playback. There’s a massive gap there to really tie music and social together. Cheers Matt, really appreciate your thoughts. Very interesting points re. driving people to Google’s OS. I hadn’t considered that part in too much detail. Where the different platforms rank in search is something i’m very interested in and have written about in the past. As you pointed out, Last.fm are the clear winners at the moment, largely due to the social aspects to their platform, and the exceptional internal linking and content that they display across their ~250,000,000 or so indexed pages…!! It’ll be interesting to see whether Google end up prioritising their Play Music All Access results above these, and if so, on what justification (if any). If Google can get me listening to the songs I want to listen to from a Google search quicker than Last.fm can, then I can see why Google might justify that. The social stuff is also quite interesting – I’m very skeptical about it working for Google, though. I guess we’ll have to wait and see! You’re not forced to use Google Play at all when you use Android or Chrome. There are plenty of other music players and services available to use. Most Android users I encounter don’t even know what Google Play Music can do or they use their OEM’s player built into the phone. I’d almost go as far as saying Google Play has actually forced people to use other things in the past rather than force you to use. 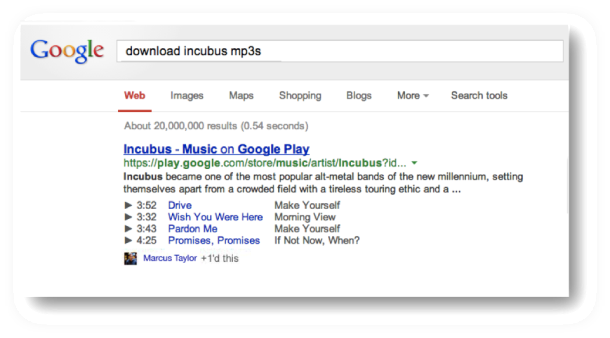 Your search intent, as expressed by the term “download incubus album” was PERFECTLY met. I guarantee that if you click on that second link to The Pirate Bay you’ll be able to download Incubus’ album. However, now that Google has launched All Access you’ll have something less convenient and more expensive. Congratulations, I guess. I agree and disagree. While i’m sure I can download that album from Pirate Bay, the prioritisation of illegal results is presumptuous and harmful. While not expressed directly, it should be a given that unless specifically stated, searching for ‘download’ *should* not be algorithmically perceived as ‘download illegally’ or ‘download for free’. I’m in no position to try and defend Google – nor bash them, but given the choice i’d rather a solution that met my search intent, was legal, and supported the creators. While All Access may ultimately be more expensive and less convenient, if it feeds money back to sustain the music industry, then I’d consider that a worthwhile compromise. You’re right – it needs to be more expensive (to someone), but it doesn’t need to be less convenient. Whether torrents are more convenient is subjective. If I can search, click and play the tune instantly from a site that I’ve paid a subscription for; then that’s more convenient than a Torrent, but also more expensive? But unlike a Torrent service, the premium service will most likely have gigs, reviews, better quality artwork, sound quality, similar artists, social comments, cloud storage, instant access from any machine etc. So Google All Access isn’t less convenient, it’s much more convenient – but only when you pay!! While I agree that “download” should not automatically mean “download for free” it also shouldn’t automatically mean “download for pay.” If the majority of the people who search for “download (album name)” ultimately click on the illegal download links then I don’t see an issue with serving that result. I’d actually say it’s more accurate to deliver the download links than the Google Play links, since Google Play is primarily focused on streaming and not downloading. If I was specifically looking to download an album and found a page to subscribe to Google Play Music I’d be rather disappointed once I signed up since you cannot download anything to your computer that is accessed through the subscription model. I think that Google might be doing this to promote subscribing and buying over torrenting, but I do not think that is their only motivation. Google typically has multiple plans behind its actions. For instance, Android was created to steer people into Google Search and other Google Products, yet Google has been able to make a decent amount of money from App Downloads, Music Downloads, etc. from the Google Play Store. The amount of money Google has made from Android is uncountable, because Android brings attention to Google Search (with ads), Google Maps (with ads), Google Drive (with paid subscription offers), Google Voice (with paid options as well), and every other Google Product. This is the same way it is for Google’s new Play Music All-Access. People who want a great Music Radio / Ondemand Music Service might choose an operating system based on the music options. Google Play Music isn’t that much yet, but it is something very unique and can get updated in the future for even more features. Right now, the ability to upload your music in addition to listening to Google’s Music Library (around 20 million songs) makes an incredible experience.